On Thursday, I stepped off the plane to a gorgeous day in London. I made my way from Gatwick to the hotel where I met C. We walked over to his office and I dropped him off before walking around the river Thames for 1.5 hours. It was a terrific day for walking and sight seeing. 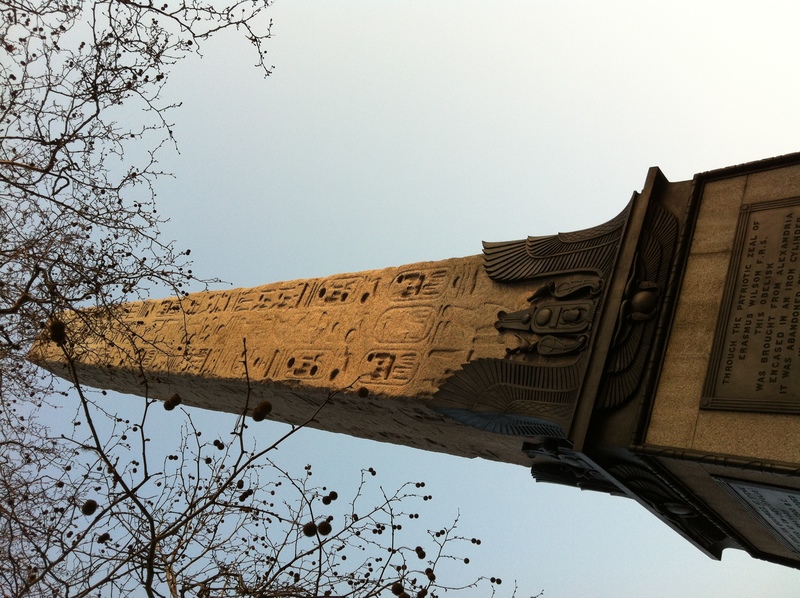 Below is a pic of one of the many statues around the Thames. That evening, we were so looking forward to some delicious, spicy Indian food. London supposedly has some amazing Indian food and we were all about it. Except that, we had horrible Indian food. Someone recommended The Cinnamon Club, which is a highly acclaimed Indian restaurant. I don’t want to make this too much of a negative post, so suffice it to say that this was one of the worst meals I’ve had in a very long time, especially for the price. Even my adorable and very mellow husband lost it. Because I can’t let it go, I’ll provide a few lowlights: we never saw our waiter again after he took our order, our first course came before our drinks, many of the hot courses were actually cold (not even warm), some of the courses were clearly pre-made earlier in the day so they were dry and old, and it took so long for the sommelier to get to us that we talked ourselves out of ordering a bottle of wine. All that for a very high price. Disappointed! So, if you want good Indian in London, steer clear of The Cinnamon Club. But, tomorrow (Friday) was another day! 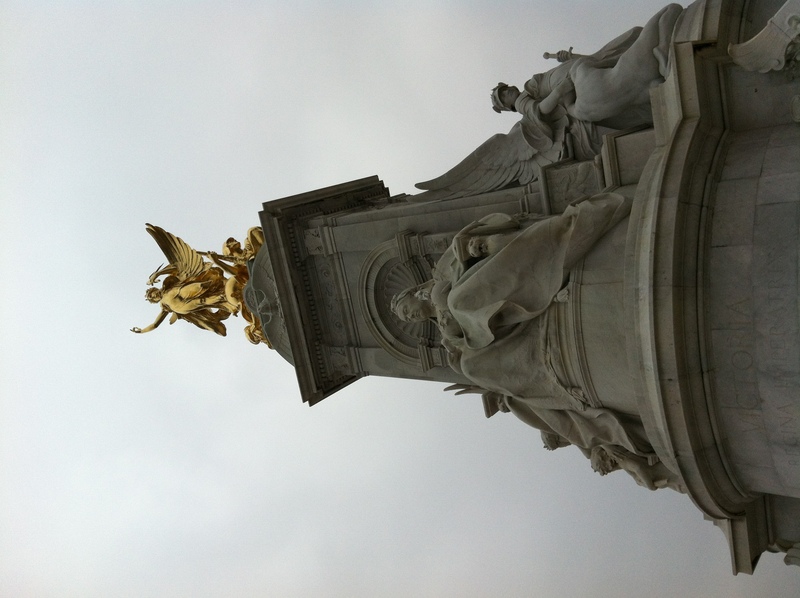 Even though the weather turned gross-London weather – cold, drizzly, and dark – I was not deterred. I set out through the park for a marvelous day of sight seeing. First stop – Buckingham Palace. Lately, I have had the uncanny knack for choosing my sightseeing days with 10,000 school children doing the same. Instead of trying to elbow my way up to the gates of the palace through 10 kids deep, I decided to act like a lady and just walk away. So, I took a picture of this angel, away from the scary mob of children. This building was spectacular inside. The chambers were all elegantly appointed, with high ceilings and stain-glassed windows. Court wasn’t in session on Friday, but I was able to roam the building and the rooms. 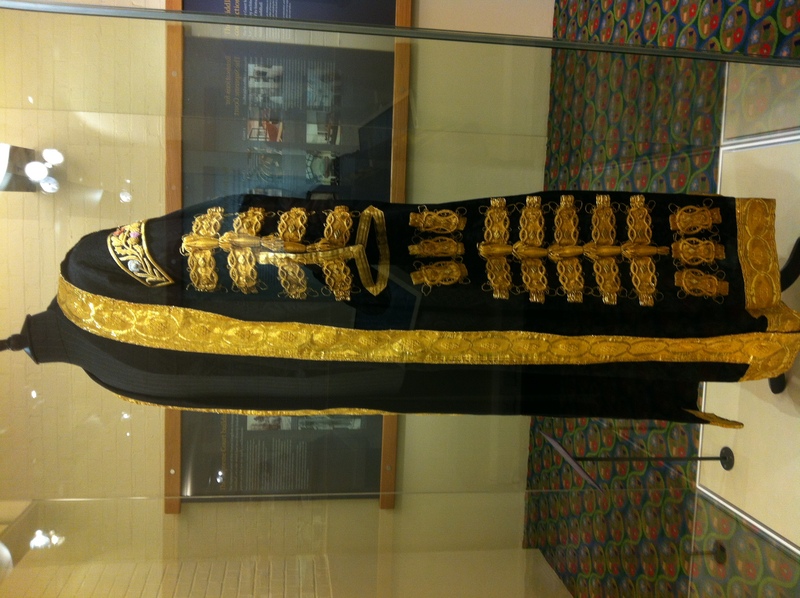 I was thinking that I missed my calling, especially since the black robes with ornate gold decorations that the justices where on special occasions are rockin’. And, my color is black, so there’s that. 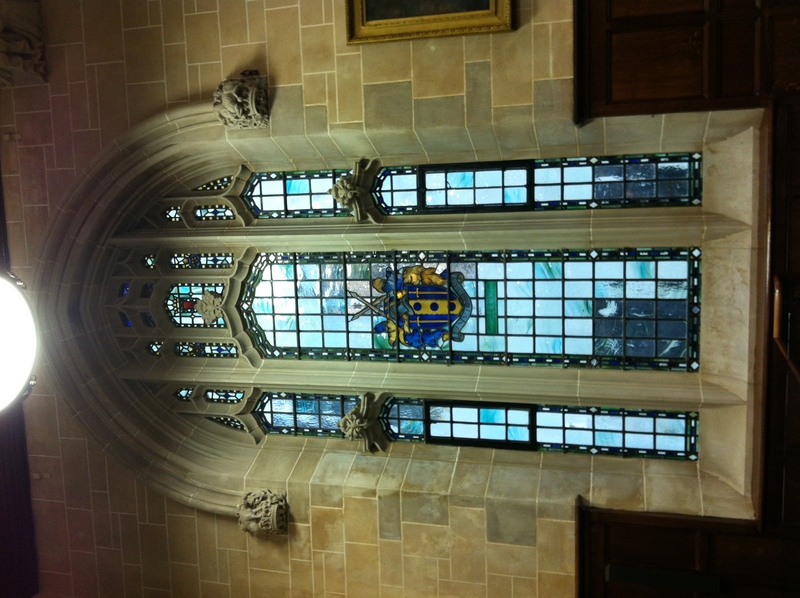 The pics below are of a courtroom window and “The Robe”. Did you know that the UK revamped their high court in 2005? Prior to that time, the UK’s highest court of appeals was formed by the Lords of Appeal in the Ordinary – the “Law Lords” – appointed by the Queen. In 2005, the Constitutional Reform Act provided for the establishment of the Supreme Court to achieve a “clear separation between our senior judges and Parliament.” Well, would you look at that. Separation of powers IS a good idea. After eating some bad yogurt in the SC cafeteria, I walked over to Westminster Abbey. I’m not one for churches, but this beast is quite something. I really wanted to touch everything and climb up the walls to get a closer look at the magnificent ceilings throughout. But, I decided that was a bad idea, since there were about 20 guards and 200 other tourists. And, pictures are not allowed, so the only picture I took was the one of the cloisters, which wasn’t all that impressive in comparison. My description of the inside of Westminster Abbey wouldn’t do it justice, since it had its beginnings in 960. There are so many people buried inside, to my surprise the likes of Chaucer (a hilarious fellow, who Paul Bettany did a very funny rendition of in A Knight’s Tale), Newton, and supposedly Darwin, although I’m finding it hard to believe the church would want Darwin buried there since I’m pretty sure his theories (as well as Newton’s) – science, right?- were heresy in the eyes of the church at the time (and, unfortunately, evolution still is to many people, bless their blinded souls). After 1.5 hours, it was time to go. I thoroughly enjoyed this remarkable place and I didn’t burn up, so this day was getting better and better. Off to the National Gallery I went. This building is also a marvel with countless, gorgeous galleries inside. Some of my favorite paintings in this gallery were by Gaugin, Manet, Cezanne, Pisarro, and Luis Melendez, an 18th century Spanish painter whose still life paintings of simple things such as jugs of olives, oranges, boxes of membrillo (quince paste) and walnuts, struck me. I think maybe it was the oranges, yellows, and his use of light. I really wanted to steal one of his paintings, but then I didn’t want to go to prison. After 2 hours and viewing at least a couple of hundred paintings, I was tired. Perhaps my spicy tofu banh mi had worn off, or perhaps I was still too cold, but whatever the reason, I decided the cure for my tired brain was cream tea. 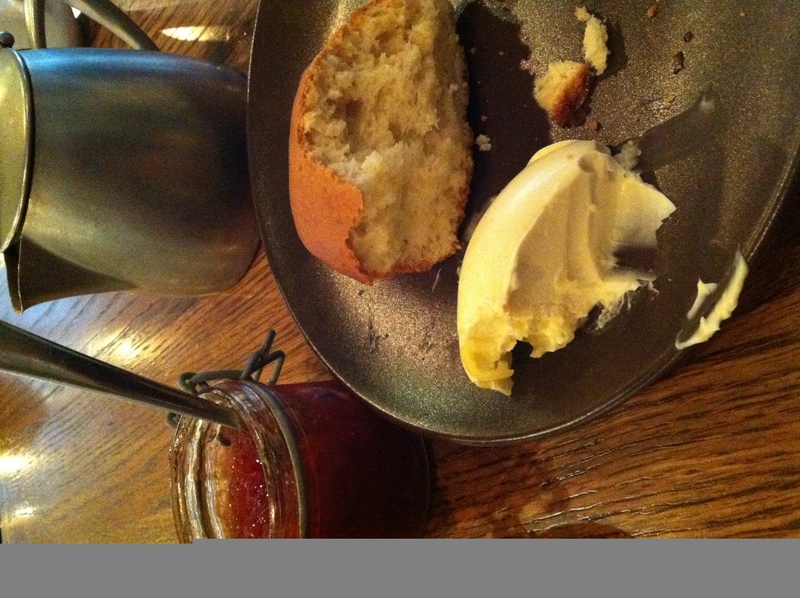 I couldn’t resist the scone, organic clotted cream (yes, organic), and strawberry preserves (picture at top). I had never had clotted cream so I decided to be English and try. MMMM, to me it was an artery clogging, combo of marscapone and cream cheese. The amount of clotted cream on the plate screamed “run” to me, so I only ate a bit of it. Plus, I wanted to save myself for dinner with my love. And, what a dinner it was! Prior to Friday night’s dinner, my impression of English cuisine was the same as Kevin Kline’s in A Fish Called Wanda – “The English contribution to world cuisine – the chip.” Oh, and bangers and mash. I did not give the English one ounce of credit within the culinary world. But, Goodman’s, how you changed my mind. That Scottish, grass-fed, 500 g, perfectly cooked, bone-in ribeye was THE BEST STEAK I have ever eaten (yes, I am shouting because it was and who would have ever thought I would shout over steak?). Carnet agreed. We were in love with it so much, we wanted to go back and have it again the next night. Alas, that wasn’t in the cards. But, if you want the best steak London has to offer, go to Goodman steak house. The sides are also expertly prepared (they did not kill the vegetables or over-salt them; they were also perfect) and the sticky toffee pudding really is to die for. Saturday night was a fun night with B and M. They took us to a very old restaurant and we had some nice food. I couldn’t help comparing it with the night before, so it was just okay. Except the rhubarb tart was amazing. The headache from too much wine today, was not. Thanks, C, for a marvelous 4 days in London! Too bad EasyJet lost my small backpack they made me check because my purse wouldn’t fit inside it. How is that one decides to employ a blind man at the baggage counter? Seriously, I’m pretty positive the guy was blind. His eyes were moving in different directions and only up, and there was a haze over them. I had this bad feeling in my gut when he didn’t touch or look at my bag but instead told me to place it on the conveyer and then asked if I had a tag on it when the huge, white BCN tag on it was 1/2 the size of the backpack, and then proceeded to ask where it was going to, where I was going to, and where I was from (why the last question mattered, I wasn’t sure). No matter, it’s just my only backpack, my only pair of running shoes (and expensive! ), my only and favorite running shorts, my only dress, my only hat and mittens, and the 6 items Carnet specifically brought to me from home. Thanks, EasyJet. I guess there’s a reason you tout yourself as a discount airline. But, tomorrow is another day! ← Montserrat… one drink at that altitude and you are done. That was one entertaining little story. No wine – hmmm a little longwinded perhaps, haaaa an englishman -nahhhh. I hope you are going to refer to Ian for your next rendezvous around England, you know that guy has to have the best Indain food down in that land! Sorry about the back pack, on a good note I had a very good St. Patrick’s being a proud Irishman and quite a nice Sunday in Oakland doing a small catering with a former student – such a joy to see the improvements and overall flow to our work together! Hope to hear more about your cooking escapades soon. I am living vicariously through this wonderful journey of yours!!! Take good care and enjoy! Ooh, how fun, Sim! Hope you have a great time in Brussels. Come visit me in Spain 🙂 I know a few good veggie restaurants. And, my silver lining is actually that they found my luggage. So, I won’t have to replace anything after all!